Here's the latest fashion amongst pet-lovers. 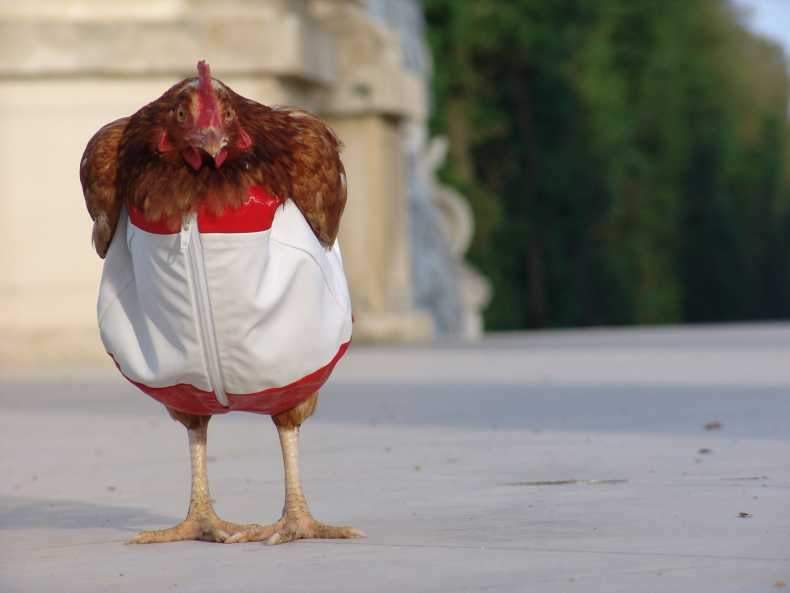 You've probably already heard about clothing of dogs or even cats but here you'll find something about chicken clothing. 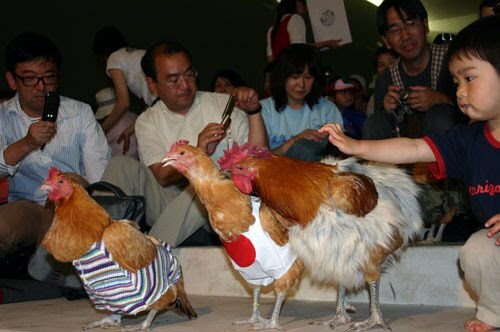 Yes, if dogs and cats can have their own suit then chickens deserve their own chickensuit, too! 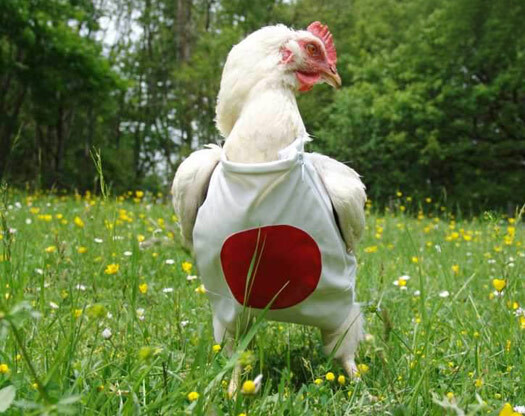 The inventors of the clothing for chickens (Austrian/Japanese design team) truly believe that there is a real need for this world to suit its chickens. Awww thier wings are under the chicken suits. Also this really reminds me of the "Chicken Thursday" commercial. The dude was like chicken thursday and there was chickens all around dressed in yellow shirts that said chicken thursday but I am pretty sure they had thier wings out which is probley more comfertable then having thier wings confined. 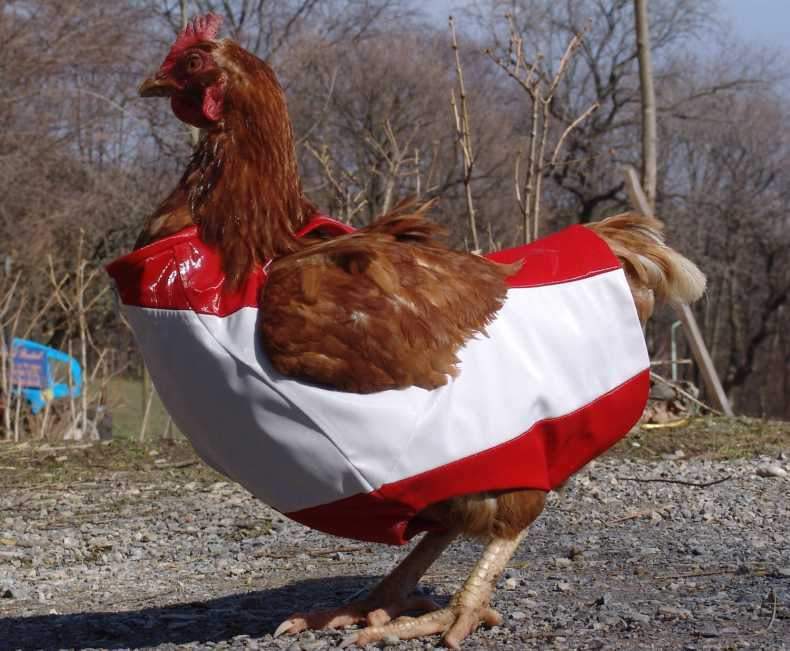 I do admit they look adorable and such but first of all it would be very hard to get it on the chicken and second of all the chicken doesn't want it to be put on and will probley peck your eyes out. WHY IS THIS A GOOD IDEA??? Our chickens would consider this an insult. 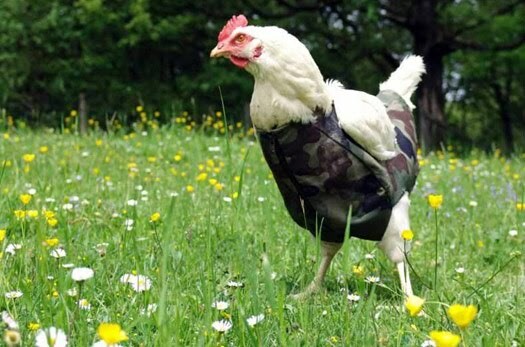 Henna Henpecker (our beer drinking hen)might like the cammo outfit just to blend in with the guys at the bar...but I dunno! 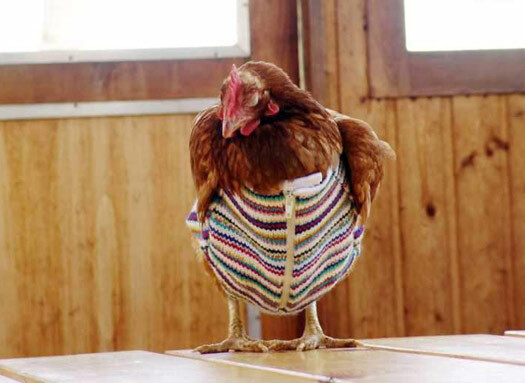 Cute idea...just not practical for ordinary chicks! 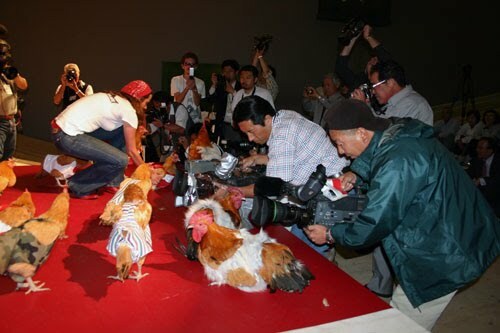 My hens overheard some PETA "talking head" on MSNBC. Now, they're all convinced they have "rights". Somehow being dressed in anything other than feathers or butter-soaked cheesecloth is suddenly "undignified". PETA ruined my life. There isn't one among them who'll wear the sombrero on Cinco De Mayo again. And that's TRADITION. The Lesson: Do Not allow your chickens (or anything else) to watch MSNBC. My roosters are literally ganging up on my weaker hens and gang banging them, and causing their feathers to tear off, and bruised backs, the poor hens are terrified. I need to protect their backs from these abusive male birds. 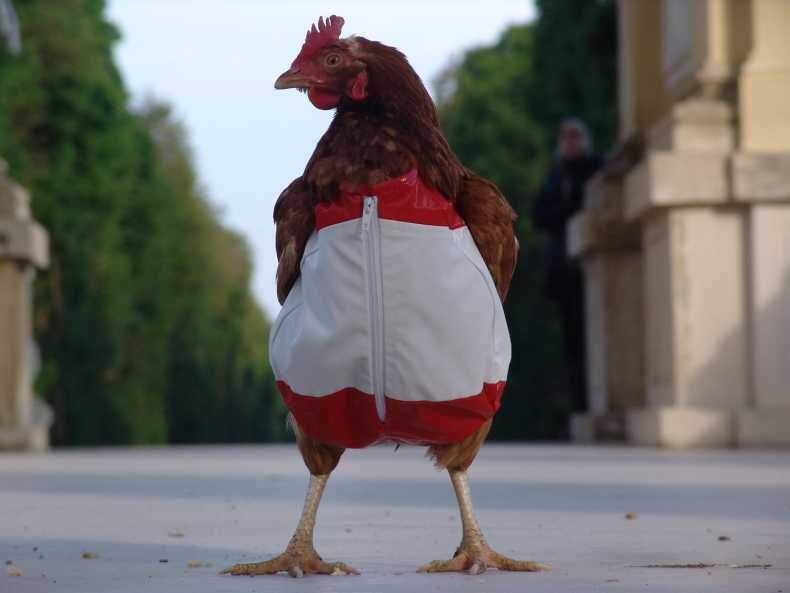 Unknown, you are absolutely right, these jackets are great for hens that are being overly abused by roosters. 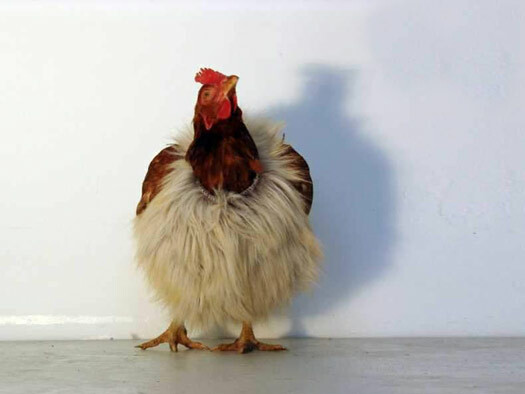 Roosters can render a hens back bare and then raw by constant mounting. The rooster needs more hens (at least 8-10 hens per rooster) to help alleviate the problem. 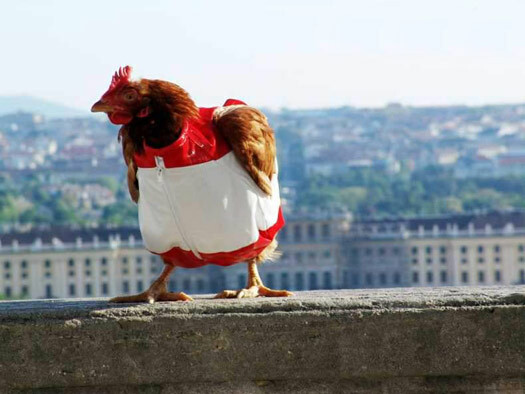 However the jackets helps the abused hens back to recover until her feathers re-grow back in. 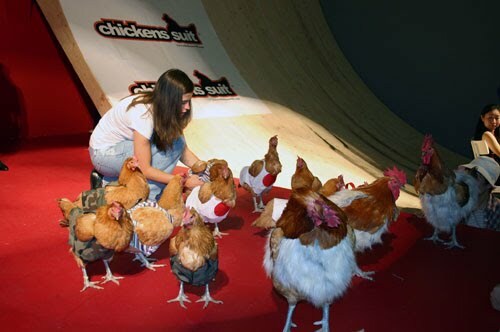 Anonymous, you said the hens wings are under their chicken suits. They are not, they are over their suits but sadly, they have been clipped to half their size to prevent them flying away which is horrible and so unnatural. It's also very bad for the hens when they return home as if they are chased by any predators they are unable to get away fast enough to escape. Hens wings should be left unclipped. They cannot fly so high anyway!